Shirley Ann Wilkes Thomas of Provo, Utah, has been called as second counselor in the general presidency of the Relief Society. Sister Thomas fills a vacancy created by the release of Janath R. Cannon, first counselor, who is serving in Nigeria with her husband as special representatives of the Church’s International Mission. Barbara B. Smith is general president in the Relief Society, and Marian R. Boyer, the former second counselor, is now first counselor. Sister Boyer is still in charge of homemaking, and Sister Thomas will be in charge of education. 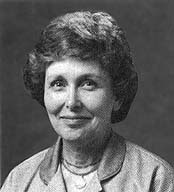 Sister Thomas has been a member of the Relief Society general board since 1971. Previously she was president of the Brigham Young University Eighth Stake Relief Society, and has been a ward Relief Society, Primary, and Young Women president and teacher. A 1946 graduate of BYU, she has been a first-grade and secondary English teacher in Oregon, New York, and Provo. For several years she taught food and nutrition at BYU. She is the wife of Dr. Robert K. Thomas, academic vice president and English professor at BYU. They were married in 1948 in the St. George Temple and are the parents of two sons and a daughter. Sister Thomas was born in Inglewood, California, to William L. and Eva McElrath Wilkes. She graduated from high school in Mesa, Arizona.